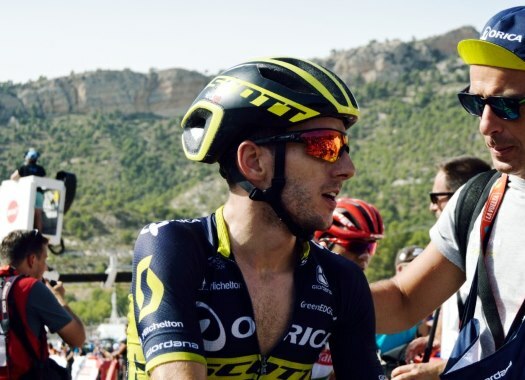 Mitchelton-Scott's Adam Yates has taken the victory of the fourth stage of the Volta a la Comunitat Valenciana. The rider crossed the mountain finish ahead of Alejandro Valverde and Ion Izagirre. The Queen stage of the Spanish race was 188 kilometres long and featured a mountain finish on the second category climb of the Ermita de Santa Lucia in Alcossebre. The escape of the day was formed after 30 kilometres of racing by AG2R La Mondiale's Silvan Dillier, Burgos BH's Diego Rubio and W52-FC Porto's Joao Rodrigues. Behind them, the peloton was pulled by teams like Bahrain-Merida, Astana, Dimension Data and Movistar, trying hard to avoid the escapees taking too much time. With 30 kilometres remaining, Dillier was left on his own. With three kilometres to go, Astana's Merhawi Kudus caught Dillier and soon left him struggling alone. Behind him, his teammate Luis Leon Sanchez and Rui Costa (UAE Team Emirates) got closer but were caught by the pack. A couple of metres later, a small group led by Adam Yates (Mitchelton-Scott) got to the front of the race while the race leader Edvald Boasson Hagen (Dimension Data) was dropped. In the last kilometre, Cofidis' Jesus Herrada was the first to attack but was reeled back in by Yates and Ion Izagirre (Astana). Yates attacked at the last metres and was followed by Valverde and Izagirre. The British rider crossed the finish line in the first position ahead of the World Champion and the Spanish rider of Astana. Izagirre's third position in the stage was enough for him to take the overall lead of the race.